JJ and I recently took a trip to New Orleans for a few days over the 4th of July weekend and on one of our many days filled with walking around the French Quarter we stopped at Johnny's Po-Boy on St. Louis Street for some authentic New Orleans sandwiches. Johnny's had been recommend to us by a friend who has spent some time in NOLA working with Give Back Cincinnati so I was very excited when we were able to visit the oldest family owned po-boy shop in the city. We tried to hit up Johnny's on a Saturday around 1pm and we could barley stand inside the fairly small dining room, it was that crowded. So we changed plans that afternoon and hit up the shop the next afternoon when it was a little less crowded. After standing in line for a few minutes and staring up at the big white board filled with Po-Boy options, we decided to split a "Johnny's special" - roast beef, grilled ham, swiss & american cheese, lettuce, tomato, and pickle - all piled up on some french bread. While waiting for our sandwich, I loved all the people watching. 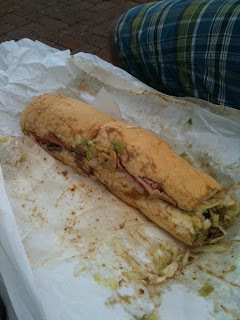 Tons of people were bringing out their phones to grab a photo of these huge sandwiches that they were about to consume. The dining room is small, but I did notice some people where headed to the back of the building so I'm guessing there was some more seating back there. Johnny's is 1 or 2 blocks north of the Riverwalk along the Mississippi River, so JJ had a great suggestion to get our po-boy to go and head over for a picnic along the river. 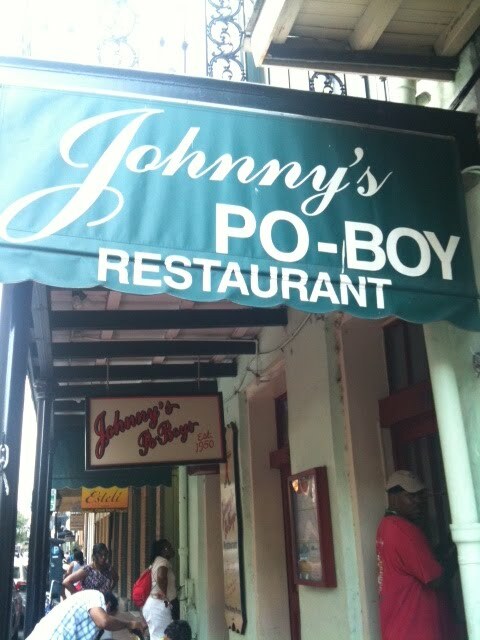 I once saw a show on the travel channel where some guy was talking about po-boys saying that the way to tell if it's a good one is when the juices run down your arm when you take a bit out of it and let me tell you Johnny's did not disappoint - it was totally awesome! 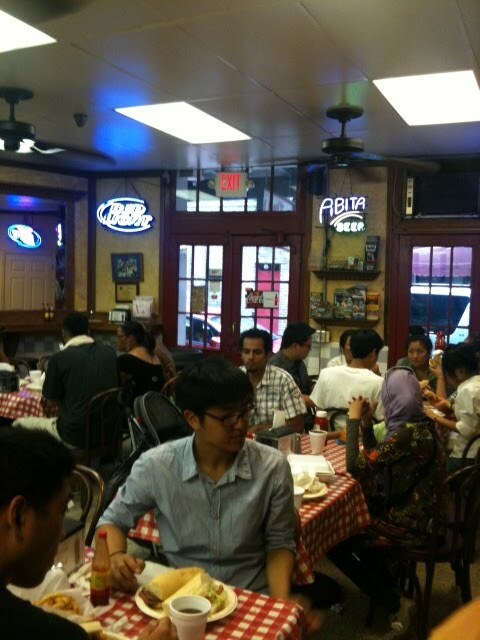 Check out Johnny's Po-Boy if you ever get to the historic French Quarter of New Orleans. Don't be discouraged if there's a line when you visit - it goes fast and if it's a nice day, then I recommend getting it "to-go" and heading over to the Riverwalk area where there are plenty of benches and open green space for a picnic.